Aloe vera recipes are easy to make at home and have plenty of skin care benefits and medicinal value. 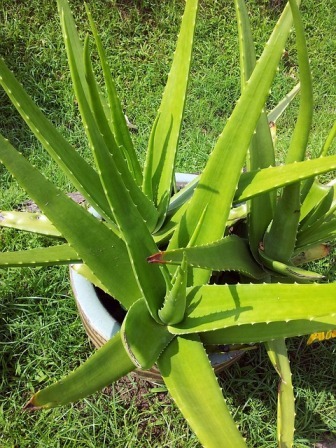 Growing your own Aloe Vera plant can be both enjoyable and a valuable asset in your aloe skin care recipes. The thick, jelly-like substance found in the leaf of the plant is naturally rich in substances such as vitamins A, C, E and amino acids for anti aging value. Using the raw, natural herb in homemade skin care and beauty recipes offers healthy components such as enzymes, B12, iron, manganese, calcium, and zinc. Aloe Vera has been known for its amazing natural healing values for centuries. Cleopatra perpetuated the use of aloe as one of her anti aging beauty secrets and its nutrient-rich wonder is still widely used in many various products today. Aloe Vera has been a natural source used to help heal burns, eczema, sores, insect bites, acne, frostbite, and damaged skin tissue. It forms a protective barrier and destroys bacteria that try to invade open cuts or wounds. It has also been known to help arthritis, asthma, and digestive uses. Aloe is well known as a soothing ingredient to help soften, hydrate and rejuvenate. It has the ability to penetrate into the deeper layers of the dermis to help regenerate the cells faster which aids in restoring the complexion. One very popular use of aloe is the healing abilities. Strong antiseptic properties soothe the pain and discomfort of many skin irritations. This wonder herb contains significant levels of salicylic acid to help in its pain-killing potential. Fresh Aloe Vera preparation tip- To begin, cut the older, outer leaves close to the base of the plant. Wash the stalks. Cut along the length of the leaf exposing the gel. Extract the inner clear gel by scraping the inside of the succulent leaf and strain through muslin or fine gauze to remove lumps. Most items for ingredients used in aloe vera recipes may possibly be already found in your own kitchen or favorite grocery store. Health food/ natural products stores may also be good shopping list choices. Mix together all ingredients. Store in air tight glass jar. * Glycerin acts as a humectant, attracting water to the skin to restore suppleness. This preparation should be stored in the fridge and should last a couple of months. Moisturizing treatments can be applied daily after cleansing and toning your face. Mix all ingredients together in a bowl. Break open the vitamin E capsule and squeeze into the aloe mixture. Apply mixture to face, throat, and décolleté. Leave on for 20-30 minutes. Rinse with lukewarm water. *Seaweed Powder is a rich source of vitamins, mineral salts, trace elements, and other rich nutrients. It detoxify’ the body and helps to rid impurities while adding beneficial nutrients to nourish. It also helps to stimulate the body's metabolism and circulation, giving skin its healthy glow. *Raw honey will ensure that you get the maximum quality of the richness in vitamins, minerals, sugar (glyconutrients) and enzymes. Very effective treatment for soothing and refreshing skin after shaving. Combine all ingredients together and mix well. Let stand for 10 minutes. Keep refrigerated, store in airtight container. Shake bottle well before use. *Witch hazel is particularly effective if you have oily or acne-prone skin because of its excellent ability to absorb oil, reduce skin redness, and a natural astringent. *Apple cider vinegar is a potent natural skin exfoliator because it’s naturally rich in alpha-hydroxy acids. Helps heal acne prone skin, close pores and sooth razor burn. Mix ingredients together. Spread it over your face, neck, and décolleté. Leave on 15–30 minutes then rinse with lukewarm water. *Clays have the ability to absorb toxins from the skin, detoxifying, exfoliating and purifying the skin, leaving the skin soft, smooth and enriched with minerals. *Lemon -Vitamin C antioxidant that has whitening, cleansing abilities. If you have acne or oily skin a cotton pad dampened with aloe can be used as a toner for its healing properties. Aloe for skin care will help dry up blemishes and restore the skin's balance. Mix together all the above ingredients. Apply mixture to damp skin. Gently massage, giving special attention to rough areas. Rinse well with warm water. *Sea salt removes dry, flaky, dead skin. Combine the petroleum jelly and coconut oil in a microwaveable bowl. Add the Aloe gel. Blend well. Microwave the mixture 2-3 minutes. Pour moisturizing lip gloss in a small glass container with a lid or empty lip gloss pots. Let cool. Cover unused mixture. All 3 ingredients serves protection from chapped lips,softens and moisturizes. Combine all ingredients. Pour in a glass bottle.